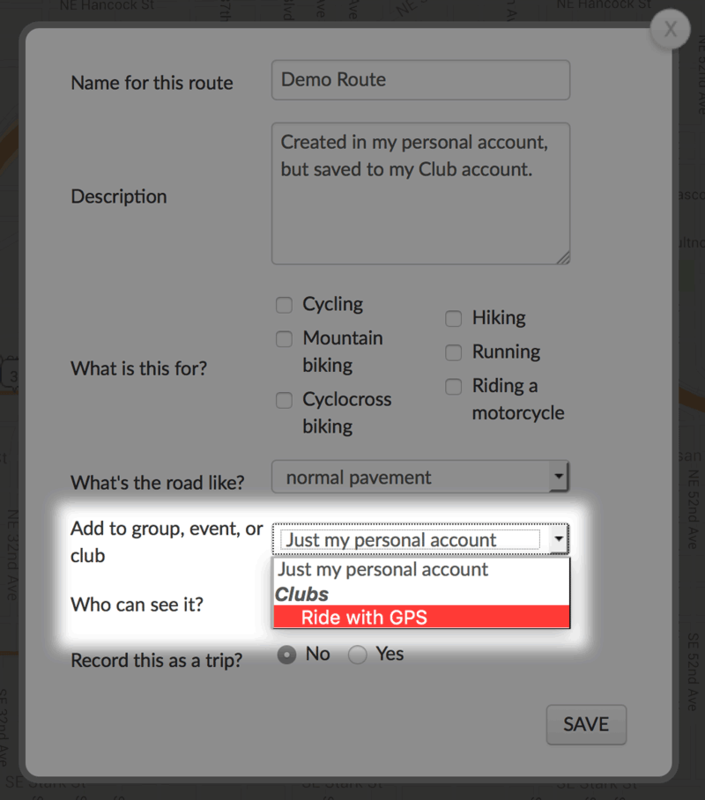 The Route Library is your central location to organize and share Club routes to your members. 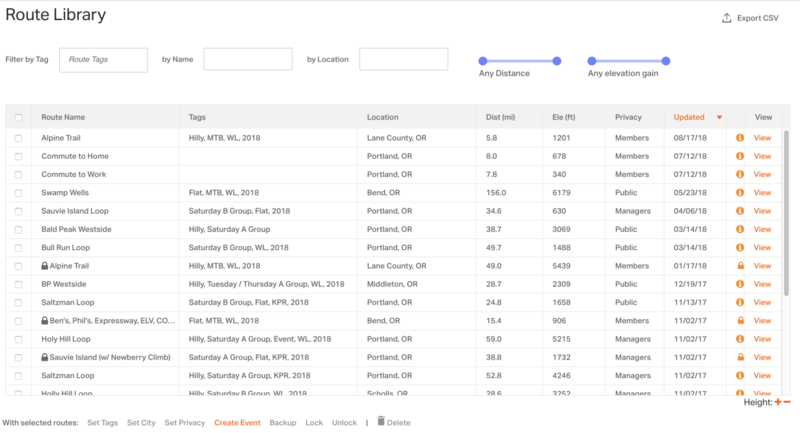 Add tags for organization, and manage route level visibility all from a single page. When you first set up your club account, we will happily transfer over all of your existing routes from an established account or group so that all existing routes and URLs to the routes will remain intact. 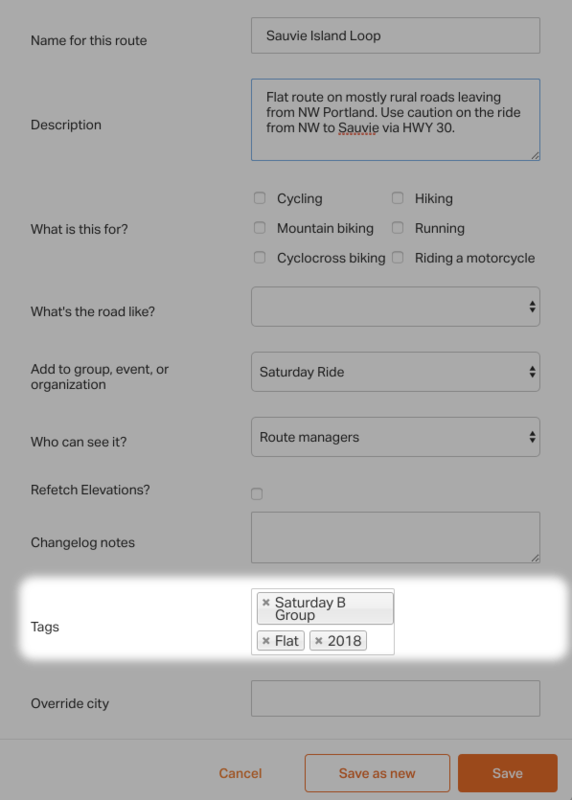 The Club account acts like a separate account, so you will have to sign into the club to plan/edit routes, add routes to the club, and add tags. Click the SIGN INTO CLUB button. The top of the menu will turn yellow to signify that you have signed in as the Club. Only an approved route manager will ever see this option. 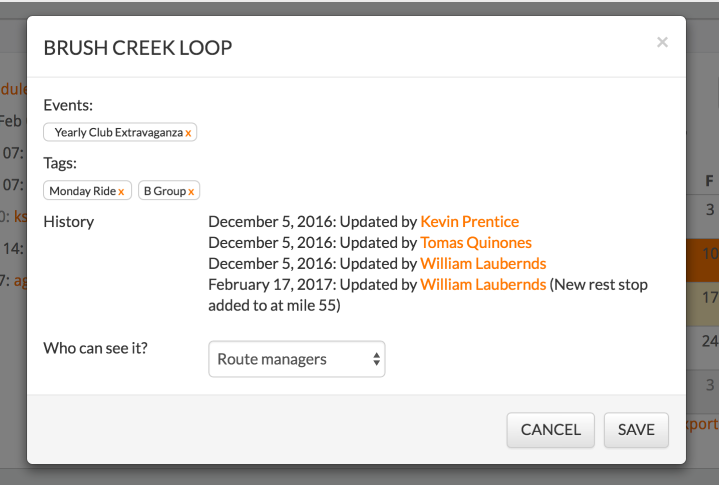 Route Managers can click “Sign into club account” to start making any changes additions to the route library. The top toolbar on the website will turn yellow to signify you are signed in with another account. If the toolbar is grey, then you are still signed in with your own account. Click SIGN OUT while the toolbar is yellow to return to your account. There are many options for sorting routes. Click on any of the header columns to sort. Click the column header again to reverse the sort order. What good is a Club account if you don’t have any routes to share with its members? 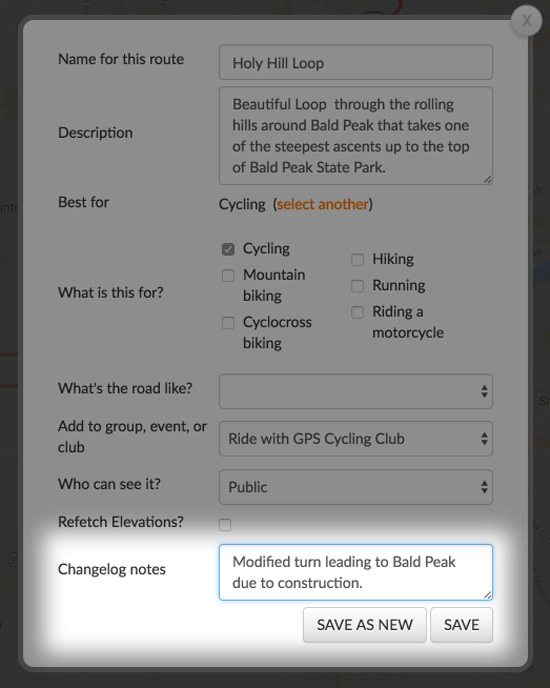 Here are a couple of ways to add routes to your club route library. While on the Club page, click SIGN IN AS CLUB. Bring up any route that you want to add to your library. In the left side panel, click MORE > COPY TO MY ROUTES. Click the SAVE button in the upper left corner. 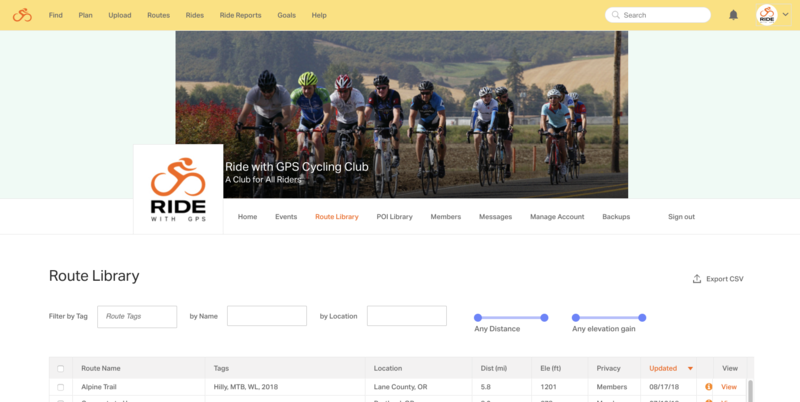 When the prompt for a route name and more details pops up, go to the drop down list for ADD TO GROUP, EVENT, OR CLUB and select your Club Account from the list. Click SAVE one last time to finish. 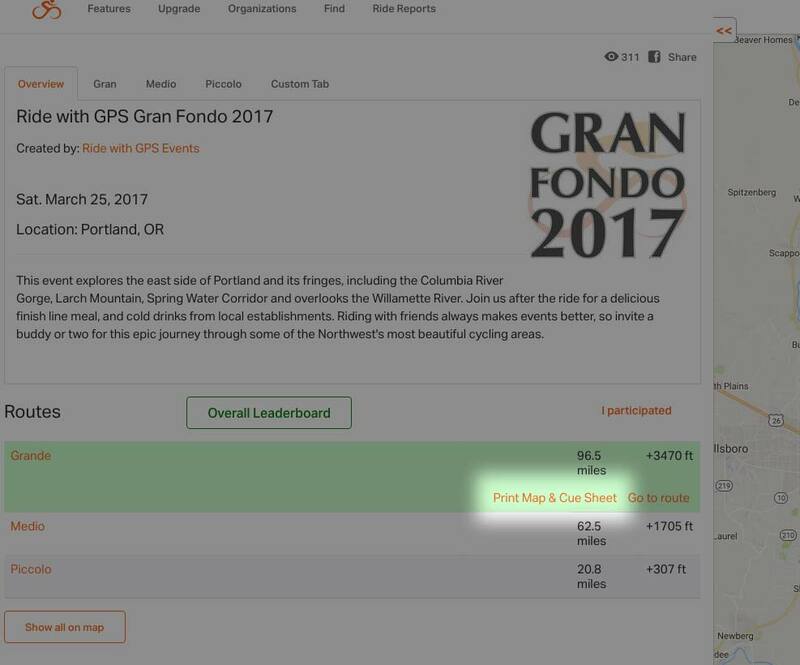 With the organization account, you can set an Official PDF so your riders can download a customized PDF map with a click of a button. To learn more about creating and customizing your PDF cuesheet. Configure your desired settings and click Set as Official PDF. 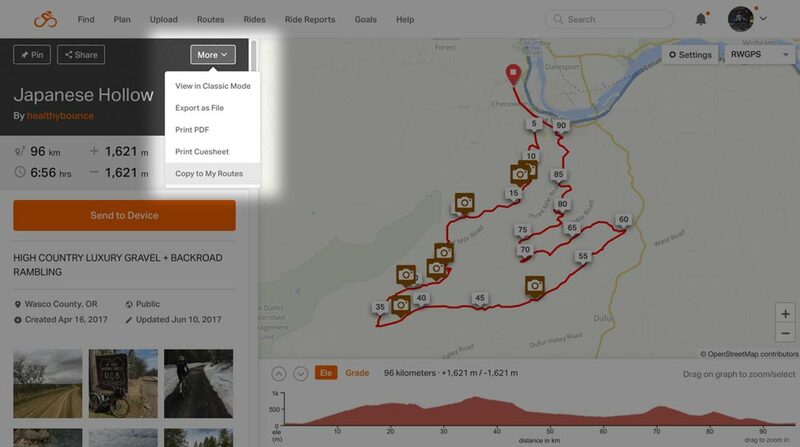 Riders will be able to download your Official PDF directly from the event page and from the route page. 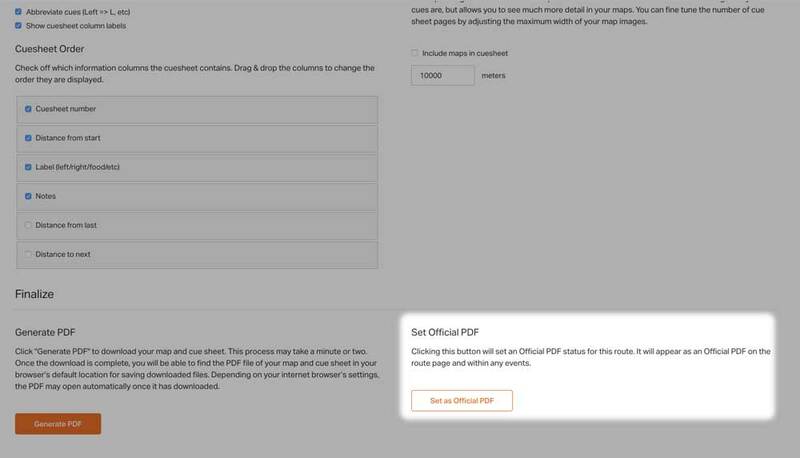 To remove your Official PDF settings, click Remove Official PDF. Select the routes you wish to tag. 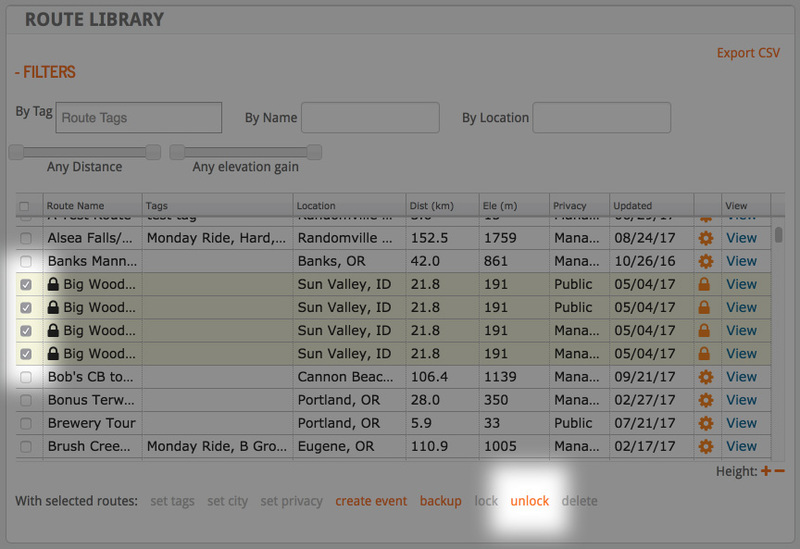 In the Route Tags field, type in the desired tag or click to show the list of available tags. After you have typed a tag, press enter to complete the tag. It will appear in a small box. Repeat these steps to add additional tags to the same route. Click the Add Tags button to finish adding the tag to the route or click Remove Tags to remove the tag from the route. You can also add and edit tags on a route while saving the route. 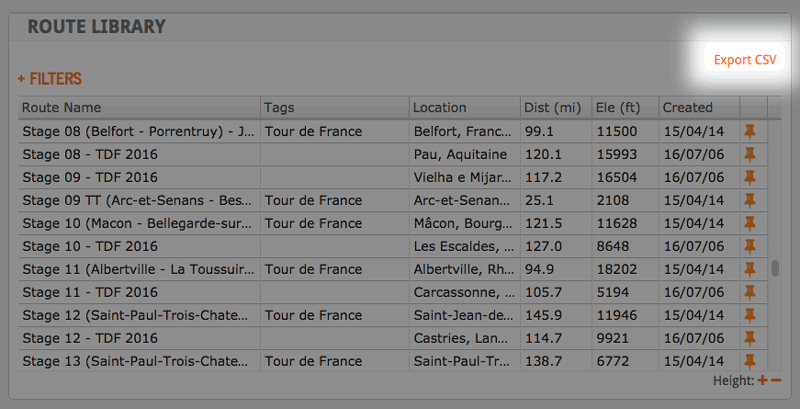 After you have added tags, you can further sort your routes by clicking filters. This will allow you to sort by tags, minimum or maximum distance, minimum or maximum elevation, route name, and location. 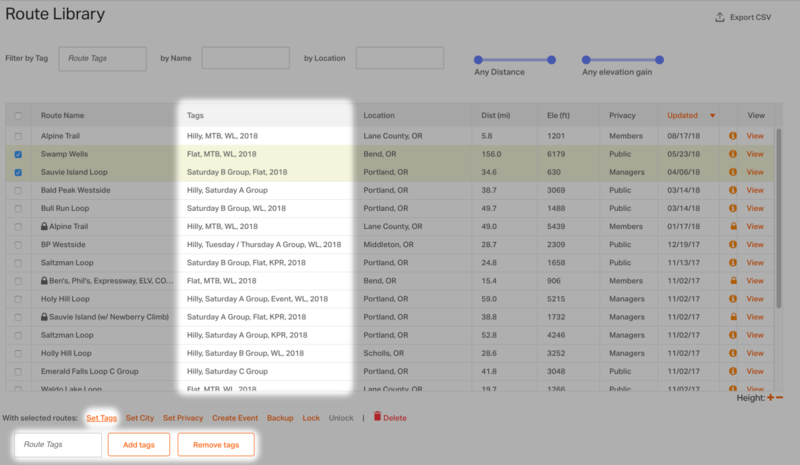 You can add multiple tags to further filter your routes and better organize large route libraries. Routes in the library can have their own privacy settings. Only a route manager will have access to these options. Public – Anyone including members and non-members can view these routes. Both members and non-members can take advantage of all the signature features for these routes. Club Members – Only members of the club can see these routes and take advantage of the signature features. Non-members will not see these routes at all. Route Managers – Only members with the ability to “Manage Routes” will see these routes. This setting is for routes that are considered a work-in-progress, or you don’t yet wish to reveal to the members until a specific date or event. Anyone with the ability to sign-in as the club account can change the starting location of a route. This is handy if you want to specify the neighborhood or landmark of the start of the ride rather than the default city. Click SIGN IN AS CLUB. Click the selection box to one or more routes. Click the SET CITY button at the bottom of the list. 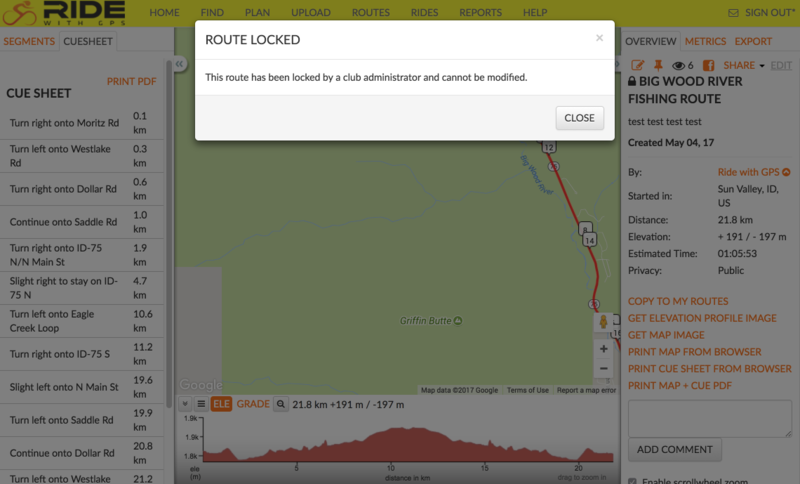 Club admins are able to lock routes to prevent any changes from being made until the routes are unlocked. 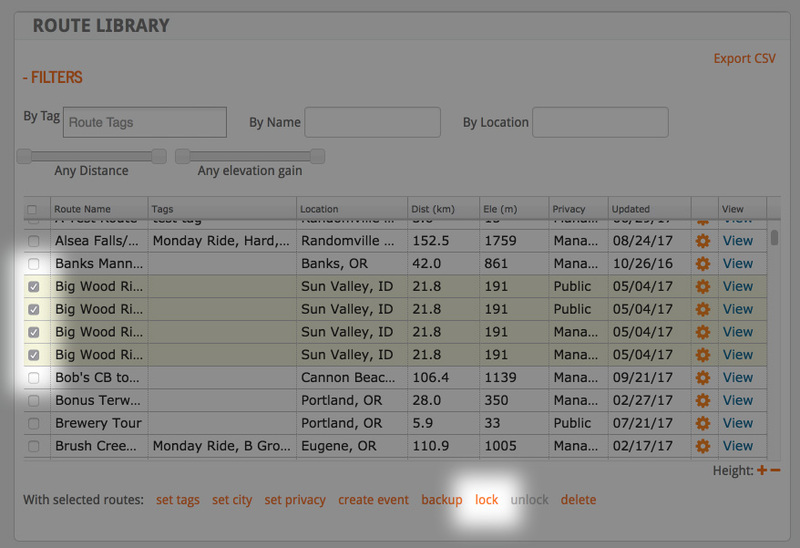 Lock routes can not be edited or deleted until they are first unlocked and only admins have the ability to lock or unlock routes. Check the boxes to select which routes to lock. Now that the routes are locked, no changes can be made without first unlocking the route. Check the boxes to select which routes to unlock. Now the routes are unlocked and may be modified by club member with Route manager privileges. If viewing a locked route, you’ll see the lock icon prepended to the route name. If anyone clicks edit (note it is greyed out) they will be alerted that the route is locked and cannot be modified. 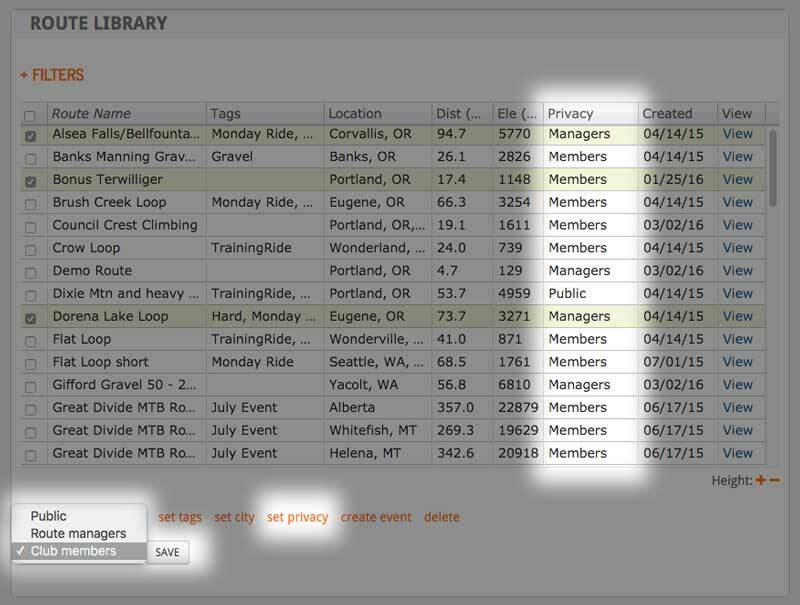 View the edit history of all of your individual Club routes, including date and route managers. Click on the COG icon next to the corresponding route you want to view. 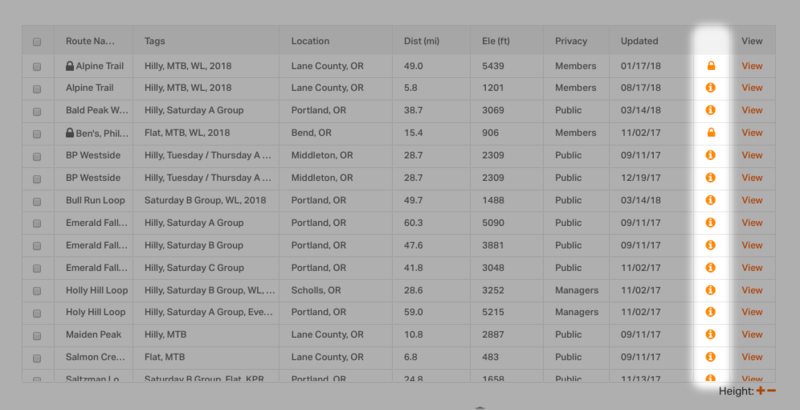 This will expand a pop up box listing the revision history for that specific route, in addition to the privacy setting and what Events and Tags are associated with that route, which you can edit. When Route Managers are saving changes to a club route, they have the option of leaving a Changelog note that describes what and why they made the changes. This option does not appear when saving routes to a personal account. 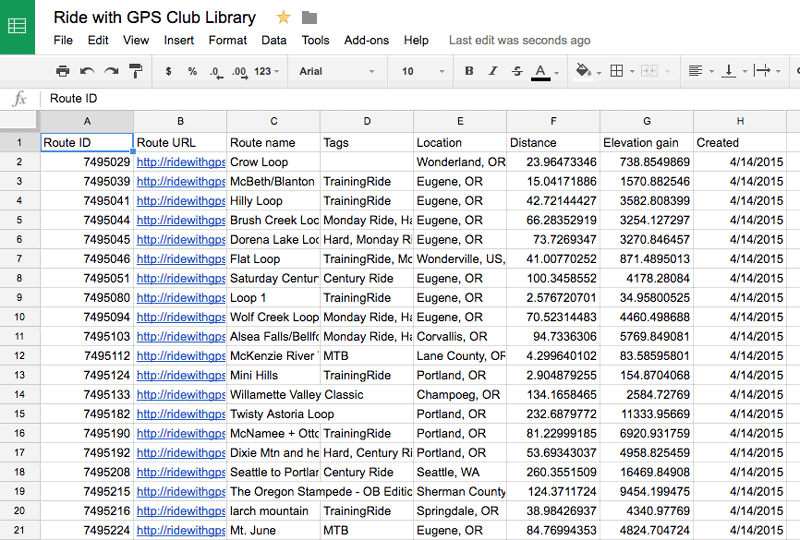 Click on EXPORT CSV to download a full list of all your Club’s routes which can then be imported into your favorite spreadsheet program. You can also export a full list of all your Club’s members from the Club Account. Click EXPORT CSV that’s in the upper right corner of the member list. Open or Import your CSV into your chosen spreadsheet program like Google Spreadsheet, Apple Numbers, or Microsoft Excel.